It's 10:45pm and Event #8: $365 NLH is down to the final 19 players. 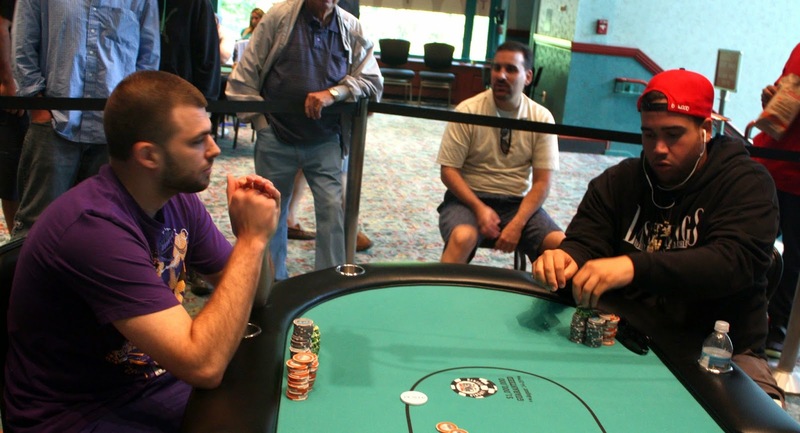 They are currently on break, and when they return blinds will be 3,000/6,000 with a 1,000 ante. 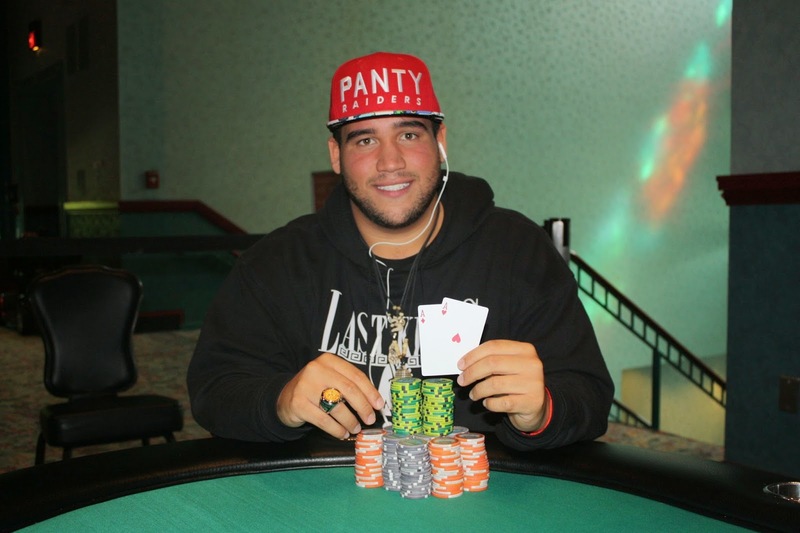 Nicholas Palma raised preflop and Jesse Mercado made the call from the big blind. The flop fell [As][3d][5c] and Jesse check called Nicholas's continuation bet. The [Js] turn saw another check-call, and the river came the [9d]. Jesse checked one more time and Nicholas moved all in. Jesse immediately snap called and revealed [Ah][Ad] for top set. Nicholas sighed and showed [5h][5d] for set under set. The stacks were counted down and it was determined that Jesse had Nicholas slightly outchipped. He will win $21,276 along with the World Series of Poker Circuit Ring. Congratulations, Jesse! Sometimes it's just not your day. Paul Torri moved all in from the button for a little over 100,000 at 6,000/12,000 blinds, and Nicholas Palma made the call from the big blind. Both players had the same hand, with Paul holding [Qs][8d] to Nicholas's [Qh][8h]. With the way Nicholas has been running, he joked to Paul that he had no chance at winning. The dealer fanned the [5c][5h][6h] to indeed give Nicholas a freeroll, and he wasted no time hitting his flush on the [3h] turn. Paul was drawing dead when the [2d] hit the river, and he will exit the tournament in 3rd place. Paul earns $9,480 for his efforts. 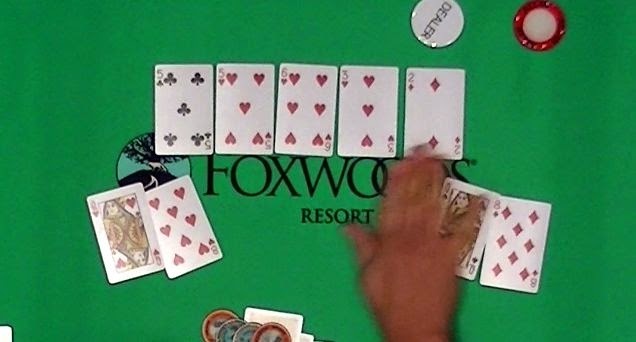 Nicholas Palma raised preflop and William Miller went all in. Action folded back to Nicholas who made the call. The flop was safe for William, falling [5d][2c][8c], but the [Js] hit Nicholas. William would need an ace or a queen to survive, but the [5c] river failed to improve his hand. William will collect $6,861 for his 4th place finish here today. 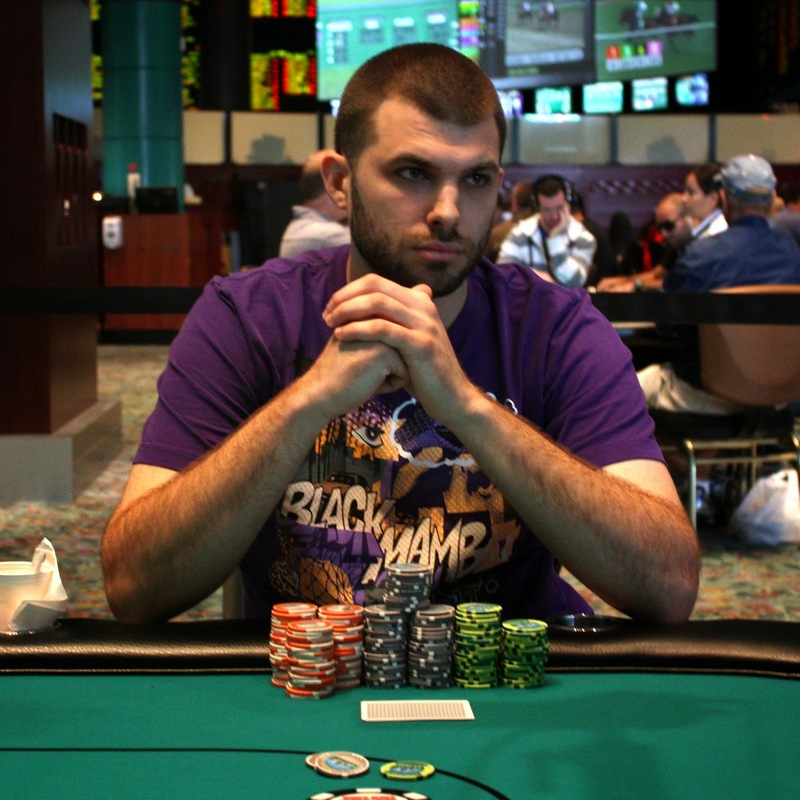 Meanwhile, Nicholas Palma is up to around 1.2 million. Jon Reinhardt has been eliminated in 5th place when his J-T failed to improve against Jesse Mercado's A-9. Jon flopped a gut shot and two overs but was unable to hit. He will collect $4,986 for his 5th place finish. 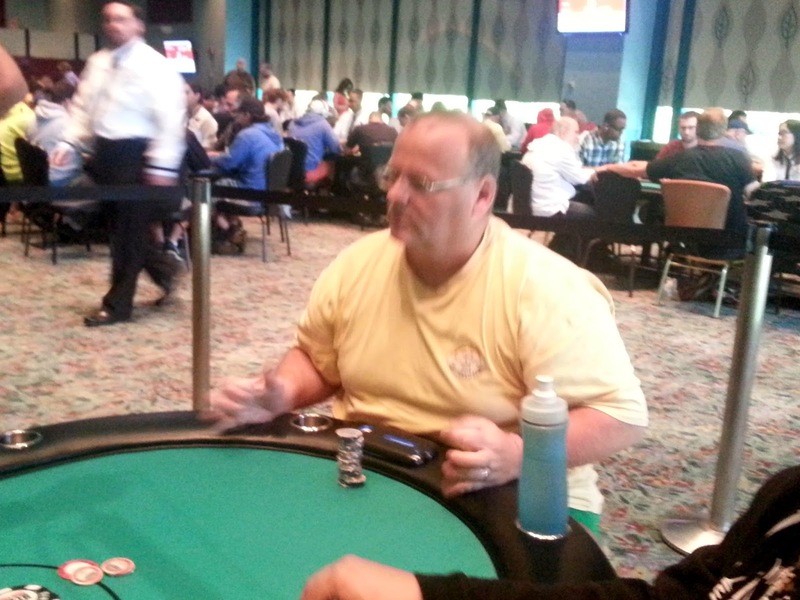 Paul Torri raised preflop from the button before William Miller moved all in from the small blind. Action folded around to Paul who thought for quite awhile before deciding to gamble for most of his chips. Paul had [Js][Th] and was racing against William's [8s][8d]. The [Ac][5c][As][2c][7d] board missed Paul's two overs, and William doubled up. On the next hand, Paul was all in with [Ac][Jh] and was a dominating favorite over his opponent's [Ah][9d]. The board ran out a pure [Th][Ad][3c][2s][3d], and Paul doubled up. He now sits on 180,000 at 5,000/10,000 blinds. On a [9h][2c][5d] flop, Michael Sanderson was all in holding [6s][6h] and was up against his opponent's [8h][8d]. Michael failed to find one of the two remaining sixes on the [Qd] turn and [5c] river, and hewill be our 6th place finisher. Michael will earn $3,638 for his efforts today. Cards are back in the air at the final table of Event #7: $580 NLH Six Max. You can watch live at www.FoxwoodsLive.com. Cards are in the air for Event #8: $365 NLH. 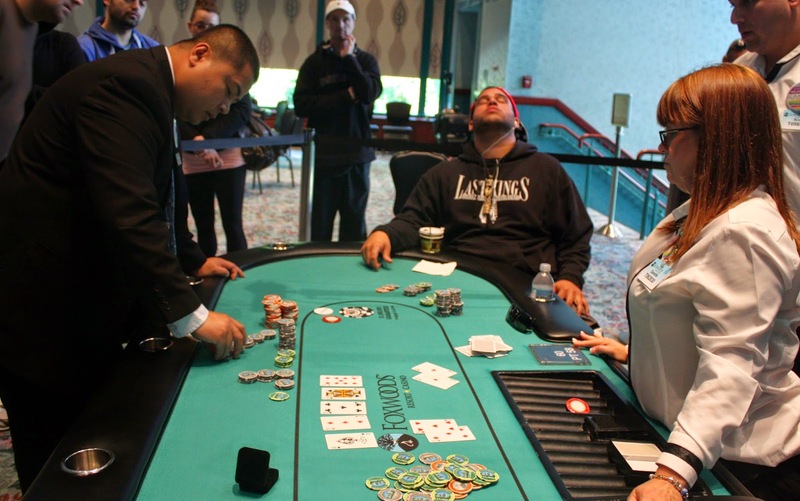 This tournament features 6 levels of registration and a 10,000 starting stack. Full structure is available here. 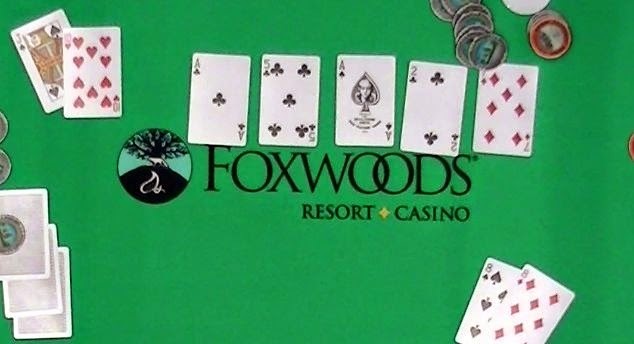 At 1pm, the final table for Event #7: $580 NLH Six Max will resume on our live stream at www.FoxwoodsLive.com. You can see full chip counts and seating assignments here.